A warranty deed is the customary form for a conveyance of real estate in Minnesota. A duly executed warranty deed includes the following covenants on the part of the grantor: (1) that the grantor is lawfully seized of the premises in fee simple and has good right to convey the property; (2) that the premises are free from all encumbrances; (3) the right to quiet and peaceable possession thereof; and (4) the grantor will defend the title thereto against all persons who may lawfully claim the same. A warranty deed, in order to be recordable, should include the original signature of the grantor and the notary public or other officer taking acknowledgments (507.24). The acknowledgment must be certified, as required by law. 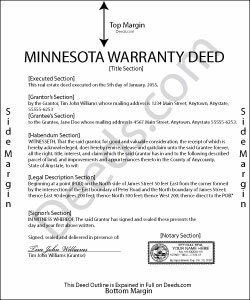 If the warranty deed is executed out of state, it is entitled to be recorded in Minnesota if it is executed as provided by Minnesota laws or according to the laws of the place of execution (507.24). A Certificate of Value should accompany any warranty deed to be recorded in Minnesota. Additionally, a Well Disclosure Certificate, if applicable, should accompany the deed. A warranty deed should be recorded in the office of the county recorder where the real estate is located. A warranty deed that has not been recorded is void against any subsequent purchaser in good faith and for a valuable consideration of the same real estate or portion thereof, whose conveyance is first duly recorded and as against any attachment levied thereon or any judgment lawfully obtained at the suit of any party against the person in whose name the title to such land appears of record prior to the recording of such conveyance. If the first recorded conveyance pertaining to the same real estate is in the form of or contains the terms of a quitclaim deed, this does not affect the question of good faith of the subsequent purchaser or be of itself notice to the subsequent purchaser of any unrecorded conveyance of the same real estate or any part thereof (507.34). Howard T. said: Easy to use and it is very user friendly. Ardys A. said: Very pleased with all the info I received and not just a blank form.